Death’s Shadow produced a clean break — including both Grand Prix and team event wins — and is probably the best deck in Modern. Weren’t Bannings Supposed to Nerf Death’s Shadow? Gitaxian Probe is kinda sorta not a real Magic: The Gathering card. Why does Gitaxian Probe even exist? The banning of this card pushed a pin into the collective bubbles of decks like Infect, Storm, and… Death’s Shadow. Gitaxian Probe had a special place in the old Death’s Shadow deck. Sure, the new version still has cards like Mishra’s Bauble, but Gitaxian Probe also cost the Death’s Shadow deck life (in most cases), (oddly) helping to grow the centerpiece threat. The previous version was mostly an offensive deck. Wild Nacatl or Monastery Swiftspear got the ball rolling; the creatures were much more plentiful… but the interaction was deemphasized. The current version is almost a Jund deck. This deck has only a few creatures (even if they are doozies)… It has a ton of midrange interaction instead. Fatal Push, a ton of direct hand destruction including the maximum numbers of both Thoughtseize and Inquisition of Kozilek, and even Tarfire have repositioned the archetype. In addition to having the superpower of being one mana, Tarfire is a Tribal Instant. As such, it’s really useful for 1) buffing Tarmogoyf, and 2) getting Traverse the Ulvenwald online super quickly. Some versions even have Seal of Fire to make Tarmogoyf that much bigger! Liliana, the Last Hope – Played in some versions (over Liliana of the Veil), Liliana can put a creature from your graveyard back in your hand. Kolaghan’s Command – Played in essentially every version, Kolaghan’s Command is a multi-pronged tool. It can lock opponents out, it can do the last two points, and of course it can raise the dead. Kari Zev’s Expertise is already format-warping. Years from now, when we look back on Aether Revolt, it will likely be the case that what we remember most about the set is how badly it helped players to cheat. Kari Zev’s Expertise is at this point the most prominent example of how Aether Revolt can break — really break — the rules of Magic to gain a massive advantage. Dan Ward was the first person to innovate Kari Zev’s Expertise in Modern (though he lost in the finals of his Regional Chapionship, to Mike’s apprentice Roman Fusco playing the Inspiring Vantage Burn deck). How Does the Kari Zev’s Expertise Combo Work? Kari Zev’s Expertise specifically says the word “card” (as opposed to “spell”). The “Breaking” half of Breaking // Entering costs two. Bingo! You can play the card Breaking // Entering for free even though if you had flipped this over with a Dark Confidant, you’d be eating eight. Ward’s deck still had Goryo’s Vengeance, Cathartic Reuinion, and other traditional enablers. Fatal Push is going to continue to be highly effective in Modern… A card (for once not Rare or worse) on the order of Path to Exile. One of the reasons that Ward’s deck seemed so reliable is that he lacked the small creatures that make Fatal Push such an effective defensive card. Pro Tour Journey Into Nyx Champion Patrick Chapin and Resident Genius Michael J. Flores go over not just a number of ways to cheat costs in Modern, but run down ideas for other archetypes like Burn, Grixis Control, or Abzan Company. Check it all out in this week’s episode! This is going to sound weird. Are we finally appreciating Scrapheap Scrounger? We already invoked the b-word. Ban. Is Scrapheap Scrounger the kind of card that should get banned? It’s honestly not crazy. Scrapheap Scrounger has a lot going for it… Maybe too much. 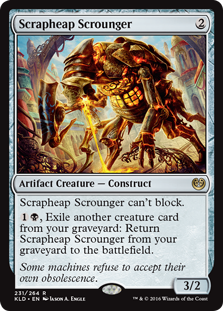 Scrapheap Scrounger is (obviously) resilient against removal, and gives its players long-term opportunities to generate card advantage. The problem, of course (well, one of the problems, anyway) is that it can go into so many different decks. At the end of the last format we saw some U/W decks bending towards black to buy it back. Today Scrapheap Scrounger is therefore not just a Staple card in colorless-heavy decks (like Mardu Vehicles) but is starting to see play in some versions of B/G, even. Delirium decks are cutting Grim Flayer for it! Of all the great things that Scrapheap Scrounger offers, perhaps the most contextually important is that with three power (for only two mana!) it can crew a Heart of Kirin. Besides the return on three power for two mana being pretty good in and of itself, Pro Tour Aether Revolt showed us the lengths players will go to to play mostly (or all) creatures that can crew that legendary vehicle. Reasonable players are cutting everything from Walking Ballista to Winding Constrictor to accommodate only threats that can consistently crew. Standard right now has got a lot of grinding and trading. A single card that can trade, card-for-card / mana-for-mana but by itself offer additional card advantage is inherently valuable in this kind of a context. 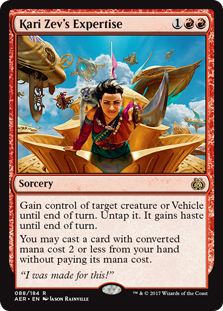 Mass removal like Fumigate can be great against Mardu Vehicles or one of the B/G decks… Scrapheap Scrounger can ensure that you always have crew for your mighty Heart of Kiran, or at least have a threat of some sort, even without the vehicle, even through Fumigate. Will it be “Copy Cat”, that combination of Saheeli Rai and Felidar Guardian? Will it be one of the many flavors of green-black (or should we say black-green) Delirium Energy? Grim Flayer or Glint-Sleeve Siphoner? Innovations in Copying Cats… Cut a Cat? The once and (presumably) future king, Dylan Donnegan took down the most recent SCG Open with his take on Copy Cat Control… A true Jeskai Control deck, Donnegan went with multiple copies of Fumigate main deck, and cut one of his sacred cows (err… cats)! Nahiri, the Harbinger does something special in this deck. For one thing, it is synergistic with Donnegan’s strategy as a Control deck. Nahiri’s [+2] ability is reminiscent of the value offered by Oath of Jace to this strategy. As a Control deck, you can often have the “wrong” answer… Fumigate against an opposing defensive deck, say. You can also dump an instant for purposes of being flashed back by Torrential Gearhulk (whether you cast Torrentual Gearhulk or use Nahiri to find it). Nahiri lets Jeskai Control-type decks to go Superfriends with Saheeli Rai. It removes certain problem permanents (e.g. Always Watching). And it completes the combo! One of the reasons Donnegan was able to cut a Felidar Guardian is that Nahiri, the Harbinger can go and find the copy necessary to complete the combo, when Ultimate! Get there! Winding Constrictor is “weirdly” good, and format-warping. If you have Winding Constrictor in play, there is a greater incentive to go wide with Verdurous Gearhulk, rather than go tall. Every creature you put a +1/+1 counter on gets two +1/+1 counters, remember. This color combination has an overabundance of riches. 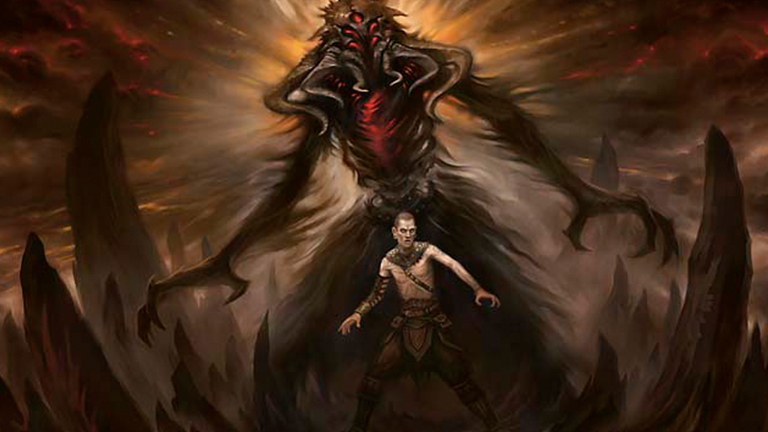 You have have to choose between Grim Flayer and Gifted Aetherborn as possible two drops… In addition to Winding Constrictor, Walking Ballista, Servant of the Conduit, etc. etc. Get ready for PT Dublin!